Back when I lived in the Interior, I did not relate to survivalist values. Adventure did not call to me as a 12-year-old, the year my family spent in Takotna, a village of fewer than 50 people. There was no amplified thrill to living in a cabin with a dirt floor on the side of a mountain inhabited by brown bears. I read books in the school library and dreaded the cold walk we were forced to take to swish fluoride at the village clinic. I often wonder if I had grown up in a family that hunted and fished if I would have enjoyed the time we spent in a remote cabin. Instead of writing relatives that I was held hostage against my will, I might have bothered to marvel at the northern lights blinking across the night sky and listen to the haunting howl of wolves. This January, the snow and the weather delayed any thought of taking the dogs ptarmigan hunting in the mountains. In addition to avalanche danger, the snow had not settled enough to allow them to spend hours above tree line in search of birds. Steve prefers Type II fun — the kind of fun that is miserable while experienced but fun as an idea and in retrospect. On the scale of fun, Type I is a sunny day on the beach and Type III is a failed polar expedition. Type II is the middle way of fun cherished by those who enjoy the result of hard physical work, food that tastes good because you are starving, and a plywood floor that feels comfortable to rest upon because you are exhausted. Those who have experienced it are reluctant to recommend eating contaminated food or sleeping on the mud-soaked floor of a shack, but they cherish the memory of hardship. I went back to the house and booked two plane tickets to where Hawaiian cowboys, known as the paniolo, have been working cattle and horses since the early 1800s. Then I arranged for us to take an open-range horseback ride and found a spearfishing outfit that targeted invasive fish. I did not feel at all guilty roping Steve into an adventure. He was the one who introduced me to the oxymoronic joy of misery when he invited me on my first duck hunt so many years ago. At the time, my only interest in the outdoors was fair-weather activities. The cold, wet duck flats revealed an endless labyrinth in search of comfort not easy to find. On our first day on the island, we rode horses as part of a guided tour. The horses followed each other, and the riders were not allowed to dismount. One of the trail guides turned out to have lived a year in Alaska working for a dog musher. She convinced us to come back for a less structured sunset ride she assured us would be fun. A large swell canceled our spearfishing trip, so instead, we visited a waterfall. After paying a dollar each, we followed a line of visitors down cement steps to view the falls, stopping several times to allow those ahead of us to take photos. When the narrow walkway opened up to the view from a safe distance, I sat down and watched what seemed like an endless line of people snap photos — the visitors were flowing more than the water. Time had slowed down as it does when standing in line. I realized how much the rigorous outdoor hunting and fishing life had changed me. I no longer wanted to sit on a warm beach or bask in the sun of Type I fun. If we had stumbled upon the waterfall alone in the clearing, the prehistoric view would have been a thrill to discover. As it was, I worried the experience was more picturesque than inspirational. I had come from a place of dreading the miserable to missing the excitement of the mountains and the cold mineral air. Instead of backcountry skiers dressed in cold weather gear, barefoot surfers carried boards. The frothy waves resembled snowpack. It wasn’t where I was that mattered as much as what I was doing — or wasn’t. We arrived back at the ranch just before sunset and headed out for the coast. The rest of the horses had been released for the night to graze on bright green African grass. Three of us rode amidst the herd in silence, weaved through shade trees and strode up a hill with a view of the Pacific Ocean. Our new friend pointed to a herd of cattle lounging on the horizon. They were all bulls. “Do you want to chase them?” she asked. The first thought that came to mind was the line from Lonesome Dove in which Gus McCrae asks his companion if he wants to chase buffalo because they won’t always be around to chase. The bull ahead of me stood his ground as my horse faced off with him. 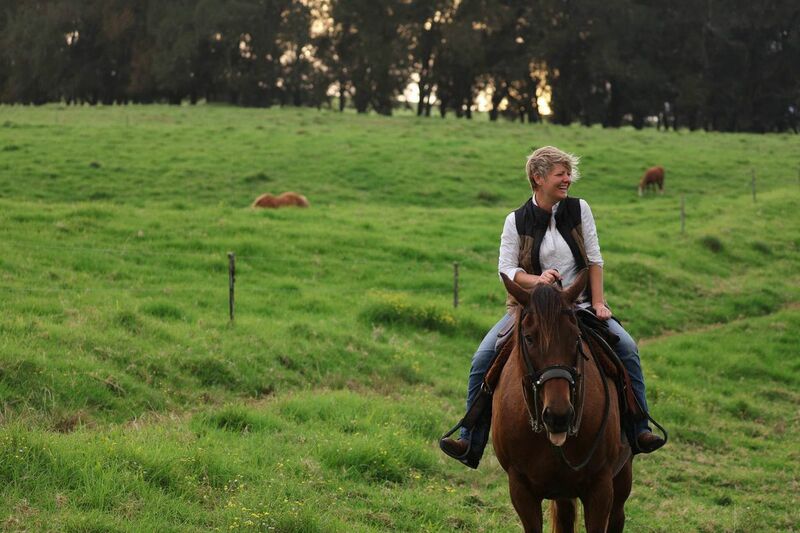 It was only my third time on horseback, and I felt the familiar fear at the edge of my comfort zone. As we rushed forward, the bulky bull lifted from a dust pile and dodged to the side. I remember how fast the horse moved and the smell of cows, pasture and leather. Chasing bulls is nothing like hunting ducks or following bird dogs into the mountains. It’s not like ice fishing or fly-fishing on a cold river. But it holds the same flicker of joy that comes from the slightly uncomfortable pursuit. You feel for just a moment that you put on your jeans and boots in the old ways and head out on the open range. You aren’t chasing cattle for your supper or to survive, but because you might have been suffering from cabin fever in your home state, and it seems even the horses and bulls thought it was all good fun. Christine Cunningham is an avid hunter and lifelong Alaskan who lives in Kenai.